Every day U.S. school children throw tons of vegetables in the trash. The U.S. Department of Agriculture requires that schools participating in the national school lunch program offer a certain quantity of vegetables each week. But most schools serve primarily re-heated processed foods that arrive frozen. 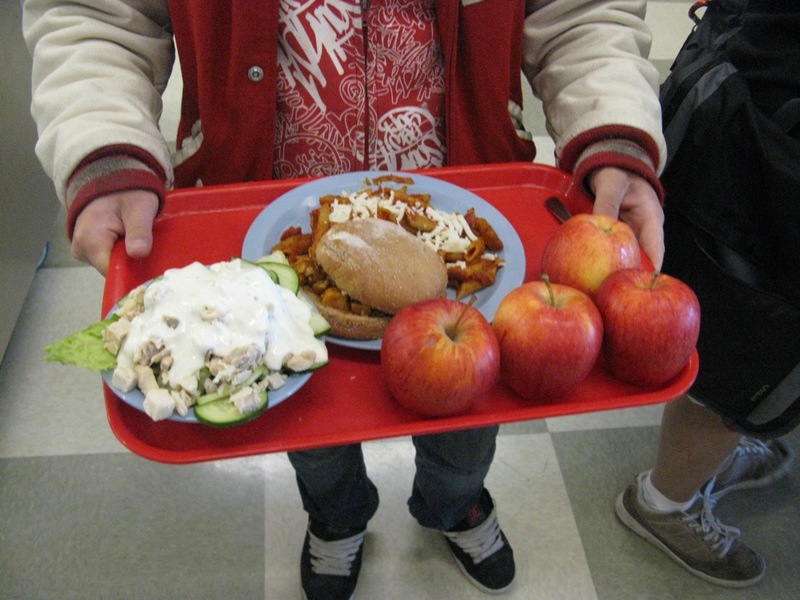 Vegetables typically land on student’s cafeteria trays overcooked and unpalatable. Ann Cooper puts her vegetable money in salad bars, where the lettuce is always crisp and the vegetables only lightly blanched or roasted, if cooked at all. Before Cooper arrived in Boulder to take over food services, the schools were gradually beginning to introduce what they called “Harvest Bars.” One of Cooper’s first acts was to install a salad bar in all 48 of the district’s schools. While in Boulder, Cooper met a parent activist–Mara Fleishman–who also happens to be national partnership director for Whole Foods. What followed was a salad bar campaign–the Great American Salad Bar Project–in which Whole Foods recently raised $1.4 million from customers nationwide, enough to install salad bars in 564 schools. Around 570 schools have applied. There are some indications the program might soon be expanded with involvement from the federal government and industry groups. But while studies suggest that salad bars can help boost children’s consumption of fruits and vegetables, some school districts decline to install salad bars claiming they are unsanitary, especially for small elementary school students with active hands and faces that often come up short of the barriers that are meant to keep coughs and sneezes out of food. In addition, a memo circulated by the U.S. Department of Agriculture in October encouraging the use of salad bars also indicated they might not comply with federal regulations if cafeteria cashiers are not checking to make sure students take the prescribed portions of fruits and vegetables when they serve themselves. She acknowledges some uncertainly around the question of how local health inspectors might treat salad bars in schools scattered around the country. But she disputes the notion that salad bars pose a potential health hazard. 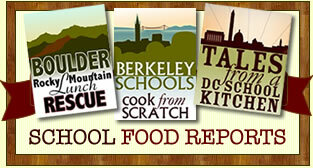 “As far as I’ve found out, there are no documented disesase outbreaks from school salad bars. By and large, this is not a high risk area,” she said. Still, she named several jurisdictions that, for one reason or another, will not allow salad bars, including Philadelphia, Austin, Tex., and Montgomery County, Md., just outside Washington and the White House where Michelle Obama is trying to get the nation’s kids to eat more vegetables as a way of combating childhood obesity. Montgomery County, otherwise considered one of the more progressive jurisdictions in the country, also does not permit food gardens on school grounds, claiming they might attract rodents and other vermin. In the District of Columbia where my daughter attends school, meanwhile, officials have said they are anxious to install salad bars in local schools. Several D.C. schools have applied for grants from the Whole Foods campaign that Cooper is managing. Others have said they don’t have the sinks or dishwashing equipment to manage salad bars. But Cooper counters that lettuce and other vegetables can be purchased pre-cut and pre-washed, and that food dispensers in the salad bars can be equipped with disposable liners, or washed in bus tubs. “There’s a way to work around those issues,” Cooper said. I wanted to make salad bars a major focus of my week in Boulder because they seem to be a logical way of encouraging children to eat more vegetables, as opposed to the cooked-to-death broccoli they’re typically served. 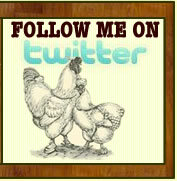 Farm to school programs have sprouted all over the country attempting to integrate local farm produce into schools. Salad bars are an obvious candidate for local fruits and vegetables. But it turns out there’s really nothing very complicated about salad bars. 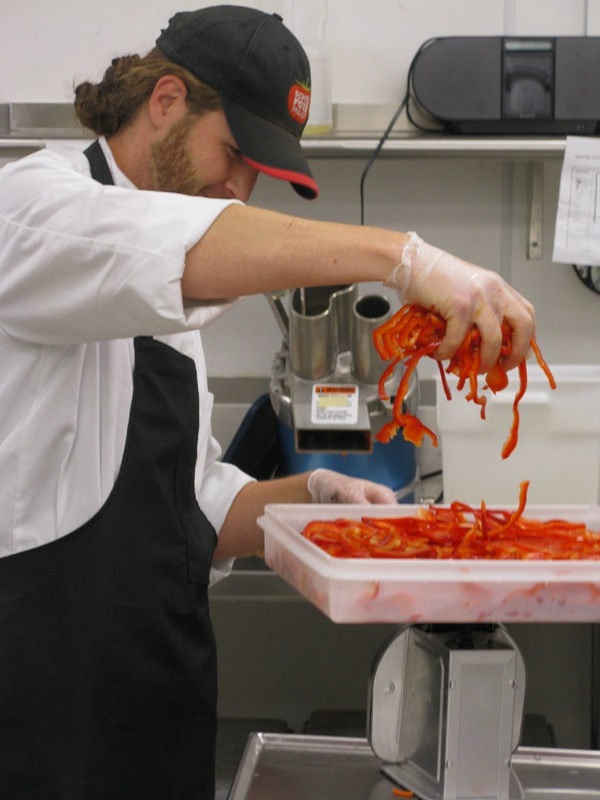 In the Boulder school district’s five production kitchens, cooks peel, slice and chop fresh vegetables such as celery, cucumbers, carrots, red pepper and jicama and ship them off in plastic containers called “fish tubs” to satellite kitchens in 48 schools. There, kitchen workers transfer them to in-house containers and label them with a date. 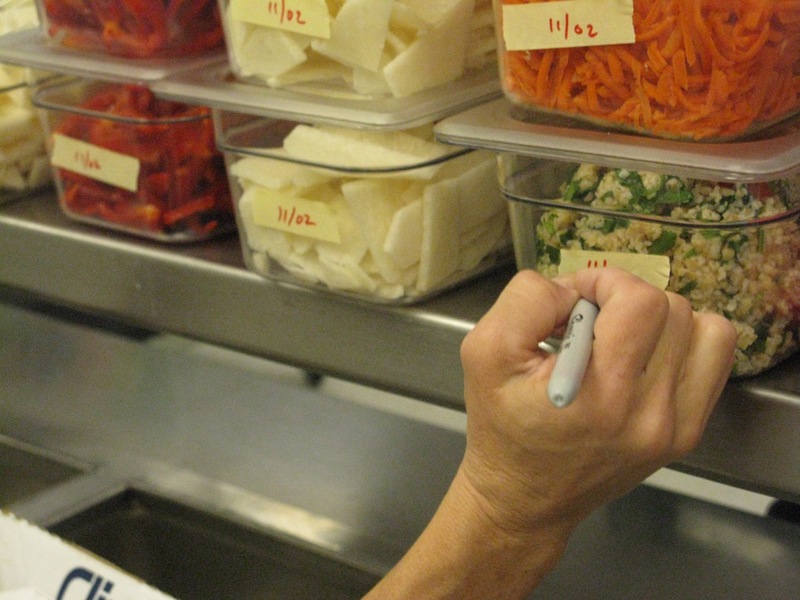 At the appropriate hour before lunch service, a kitchen worker begins assembling the salad bar using the fresh vegetables as well as any number of other food items: canned kidney beans, chickpeas, tuna salad, egg salad, hard-boiled eggs, pickled jalapeno, cherry tomatoes, diced chicken, lettuce and cottage cheese. While I was there, the kitchens were using packaged Romaine lettuce pre-washed and pre-chopped from Dole because the usual bulk “spring mix” from California had been sub-par lately, Cooper said. 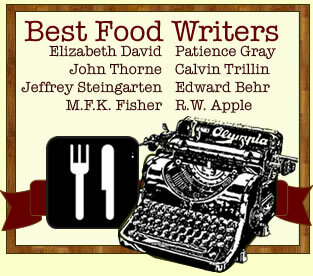 Frozen peas and frozen corn kernels, once thawed, also appear on the salad bar, along with three dressings displayed in squirt bottles, ranch being the hands-down favorite over Italian and balsamic. In theory, a student could compose a complete meal at the salad bar and that would be perfectly fine with the USDA–as long as a kitchen worker checked to make sure all the required components were in place before approving it as a reimbursable meal. Sometimes the kids get encouragement to try things they may not be used to. Erica Goodman, a graduate student in media studies at the University of Colorado, Boulder, volunteers in the local schools as part of a campaign to boost participation in the subsidized meal program. Sometimes at elementary schools she simply stands by the salad bar and challenges kids to fill their plates. In the upper grades, not all kids take a salad, but from what I observed enough do to make the salad bars worthwhile. Lunch in the high schools appeared to be a busy time around the salad bars. Teenagers were not at all shy about loading their trays. Under USDA rules, schools who use the so-called food based meal plan, as in Boulder, must offer students five lunch items covering basic food groups, plus milk. They are only required to take three to qualify as a “meal” for purposes of federal reimbursements. For instance, nachos with chips, a scoop of taco filling and a topping of grated cheese would qualify. But then students can pour their own milk if they choose from a dispenser, and help themselves to unlimited amounts from the salad bar, where whole fruit also is displayed. 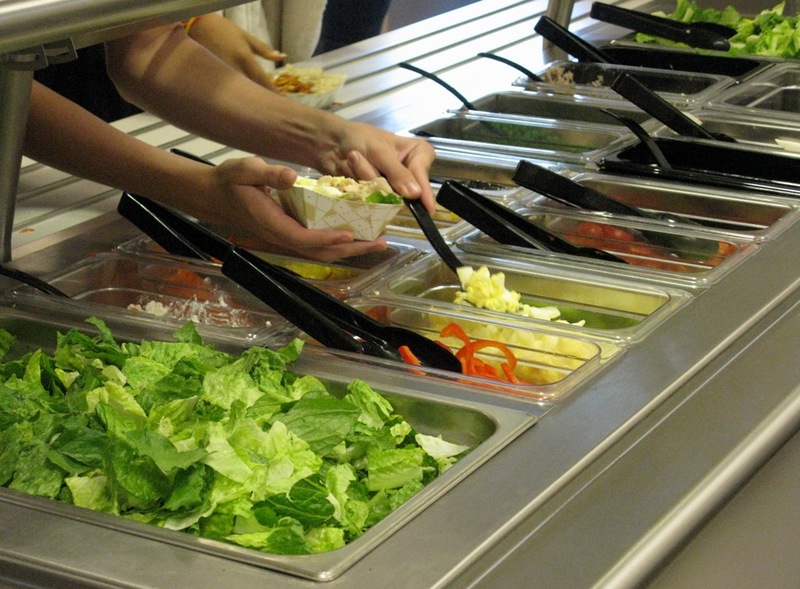 Spring Branch ISD in Houston, TX won’t go for salad bars for many of the reasons you cite. Unsanitary for elementary, hard to determine reimbursable meals, and the opportunity for kids to create unreimbursable meals. They do offer entree salads.